There are only so many ways to alter how you draw a circle. At the end of the day, you’ve still drawn a circle and the only difference is how you got there. Katee Sackhoff stars in “Oculus”. “Oculus” starts with promise because Jason Blum is attached to it. Blum’s production company, Blumhouse Productions, is responsible for so many Hollywood horror films as of late that it’s impossible for your concept of horror in the past decade not to be impacted by him. Just to name a few, we’re talking about “Paranormal Activity” (2007), “Paranormal Activity 2” (2010),” “Paranormal Activity 3” (2011), “Sinister” (2012), “Paranormal Activity 4” (2012), “The Purge” (2013)”, “Insidious: Chapter 2” (2013), “Paranormal Activity: The Marked Ones” (2014) and now “Oculus”. And 2014 and 2015 already have “The Purge: Anarchy,” “Paranormal Activity 5,” “Amityville” and “Insidious: Chapter 3” en route. While Blum has no problem releasing films, that doesn’t mean their effectiveness isn’t waning. Perhaps it isn’t his fault that some are hits while others are misses. Rather, it’s more a factor of him oversaturating the market and his own production company that’s so influential in shaping it. Garrett Ryan (left) and Annalise Basso in “Oculus”. From 2007 through today, the first “Paranormal Activity” and “Sinister” were the most revolutionary and scary. But none of them remember what used to be effective about classic horror films such as “Psycho” (1960), “The Birds” (1963), “The Exorcist” (1973), “Carrie” (1976), “Alien” (1979), “The Shining” (1980) and even more recently “The Ring” (2002). “The Birds” is a perfect example because it took something simple that people are actually afraid of – birds – and wrapped them inside a terrifying story. Even if you weren’t previously afraid of birds, the increasing viciousness of the real-life plot device instills plenty of fear in you and even makes you think twice about them long after. Horror films today are obsessed with shifting from real-world fears to the paranormal. It’s a world that some of us believe in, some of us claim to have experienced and some of us think is complete and utter poppycock. By the very nature of those varying audience beliefs, the films play to our emotions differently. They’re less effective for the cynics, more so for the believers and alienate people who don’t like to be scared at all. “Oculus” starts with that already limited audience and then simply attempts to tell its story through a single object: an antique mirror. It hits a tipping point where all hell breaks loose. While initially building a promising slow burn, the climax too eagerly reduces itself into a formulaic collection of subpar tricks you see coming even with your eyes closed. Instead of a mirror, like-minded flops have used an antique box (such as a dybbuk). In 2012’s “The Possession,” which bombed, we have a box that’s supposed to create fear from its Jewish heritage. The box is said to hold a malicious possessing spirit that’s believed to be the dislocated soul of a dead person. Anyone who owns it goes nuts or dies. “Oculus” is literally the same exact story but with a mirror instead of a box. To its detriment, “Oculus” does an even worse job explaining the back story of its mirror. It just asks you to be afraid of it because of the supernatural things it does now. But we learn nothing about the malevolent spirit in it, why it’s so pissed off and what it wants. Left to right: Kate Siegel, Rory Cochrane, Bob Gebert and Justin Gordon in “Oculus”. “Oculus” wins with what it does inside its own mind, which incites yours without needing gore to bring about fear. But the most glaring problem is it doesn’t need to be a “ghost story” to get you there. It lazily avoids writing in any supernatural history. The film just picks up with an adult brother (Brenton Thwaites) who’s getting out of the crazy bin. He has spent so many years trying to pretend (through therapy) that the supernatural force of the mirror didn’t rip apart his parents when he was a kid. All the while, his sister has been living life as a believer. She’s determined to destroy the mirror so it can’t continue killing its growing list of victims. But why? Again, we don’t know. If you prefer progressional storytelling that always moves forward in a straight line, you’ll hate how “Oculus” constantly jumps back and forth. Depending on how your brain is wired, the concept of past and present time shifting will either be hard for you to stomach or it’ll be a device that lends to the film’s psychological intrigue. For me, it gets old and feels like it’s trying too hard. Making matters more complicated, “Oculus” tells its story through two sets of the same people: the child version of the brother and sister and the modern-day version of them all grown up. They flash back and forward and even intersect at the same time (as if they meet each other in the same room). Where “Oculus” gets interesting is in how it treats the mirror as a clever and psychologically-twisted person (even though the evil spirit itself is never embodied or visualized). Gillan plays the adult sister (Kaylie Russell). She has a fascinating relationship – even having conversations – with the mirror. Kaylie is just waiting for the mirror to present its next trick, she’s anticipating them and she’s even impressed by them. The mental shenanigans that translate into confusing altered visual realities give the film powerful creative liberty. 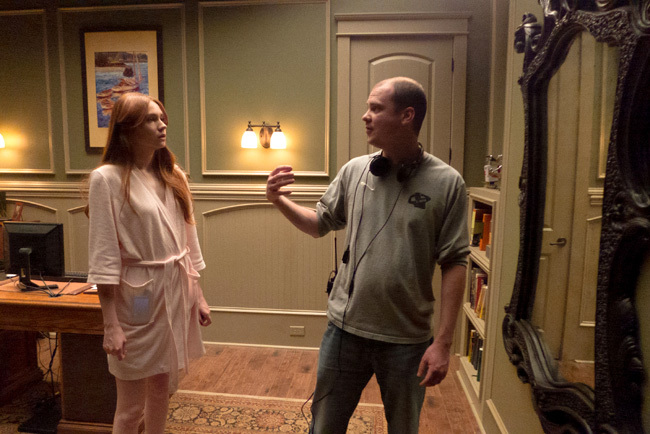 Karen Gillian and director Mike Flanagan set up a scene in “Oculus”. The mirror controls your eyes and shows you want it wants you to see. Kaylie bites into an apple, for example, only to realize it’s a light bulb and now she’s got a bloody mouth. She slices a glass shard into someone’s neck, but finds out it’s unintentionally her fiancée. Daddy removes a Band-Aid, but he’s actually ripping off his finger nail. But it takes Kaylie longer to be afraid. Her hatred for the mirror – and sometimes even her admiration of it – is the most interesting part of this film. When she finds it again at an auction, she greets it like it’s a long-lost friend. All the while, she’s determined to kill it and remembers that it’s the reason her parents died so violently. She’s supposedly the normal one. It was her brother who was locked up in the crazy house for so many years. But Kaylie’s relationship with the film’s primary fear factor is by far the deepest, darkest and most fascinating underlying story. It’s a victim running back to her abuser and her feelings for it aren’t all hateful when you’d think they should be. Her character is far and away the best-written one in this film, but a film is only as strong as the sum of its complete parts. We needed the other characters to be complicated like her. Instead, we have characters like the adult brother, who is totally forgettable and only holds her back. We even see some other random dead people – signaled by their white eyes – and they only help the story to become trite. Going back in time and watching the mirror consume her parents until their bitter ends allows for some decent acting by Rory Cochrane (daddy) and Katee Sackhoff (mommy). But ultimately their being sucked in by the mirror couldn’t be more predictable and forced. Even Annalise Basso (the kid version of the sister) and Garrett Ryan (the kid version of the brother) did a fine job of acting with a decent script that could have been so much more and ultimately falls apart. It is the film’s promising script that is its ultimate disappointment. While it shows veteran experience with the ability to build tension, it ends up only being a mildly entertaining project that fails to connect a cohesive back story with an original beginning and a surprising conclusion. “Oculus” stars Katee Sackhoff, Karen Gillan, Rory Cochrane, Annalise Basso, Garrett Ryan, Brenton Thwaites, James Lafferty, Miguel Sandoval, Kate Siegel, Scott Graham and Katie Parker from writer and director Mike Flanagan and writer Jeff Howard. The 105-minute film is rated “R” for terror, violence, some disturbing images and brief language. It opened on April 11, 2014.